Until I came across Empty Mansions by Bill Dedman and Paul Clark Newell, Jr, I had never heard of Huguette Clark and her story intrigued me right away. With a fortune of almost $300 million dollars, this shy and reclusive American heiress spent the last twenty years of her life cooped up in a hospital room, despite being perfectly healthy. An eccentric woman who gave $30 million dollars in gifts to her nurse and wrote cheques to others almost every day, Huguette had a love of cartoons and often watched The Smurfs and The Flintstones. Huguette was a musician and painter at heart and owned many priceless artworks including paintings by Degas and Renoir. She also collected hundreds upon hundreds of dolls and dollhouses. Huguette owned several magnificent homes, although hadn't stayed in some of them for decades. When Huguette Clark died at the age of 104, 19 family members tried to get their hands on her money. Paul Clark Newell Jr is a relative of Huguette and together with Bill Dedman bring us the details of this amazing woman and her life in Empty Mansions - The Mysterious Life of Huguette Clark and the Spending of a Great American Fortune. A fascinating read which had me diving for Wikipedia to see what her dolls or mansions looked like, I thoroughly enjoyed reading Empty Mansions. If my snippets above piqued your interest at all, you'll love this one too. See below for details on how to WIN your own copy. 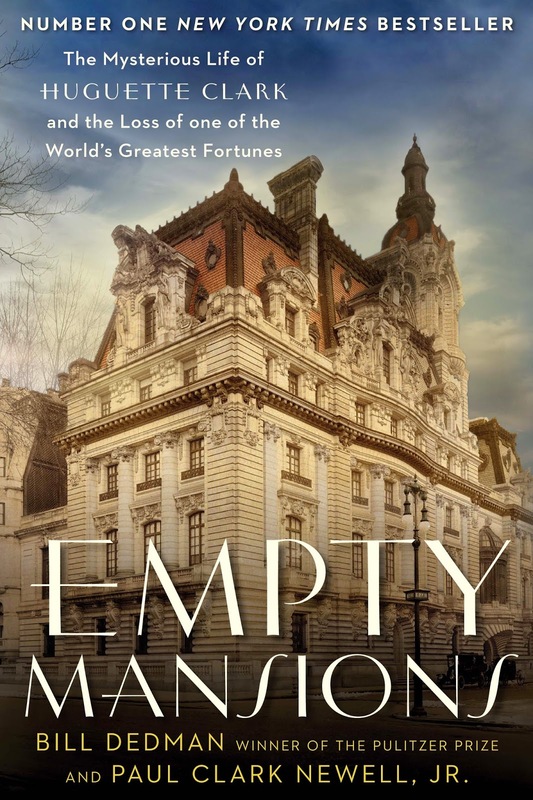 To enter: to WIN your very own print copy of Empty Mansions by Bill Dedman & Paul Clark Newell, valued at RRP $32.99, answer this question: if you could own a luxury mansion in any city in the world, where would it be? Leave your answer in a comment below to earn one entry. Closing date: entries close at midnight on Friday 21st November and the winner will be drawn using random.org and announced here. The winner will have 5 days to claim their prize or another winner will be drawn. I am a email subscriber and follow through Google friend connect. Hi Amanda, thanks for your (multiple) entries, Paris is a great choice, and Huguette was fond of France. Good luck! Melbourne, I think its perfect here short of the sometimes questionable weather and high housing cost. If I had the housing taken care of it would be just about right. Thanks for your multiple entries Jessica, Melbourne is an interesting choice. I live here too and agree it's a great city, would you opt for a house or apartment? Huguette had both, but I quite liked the descriptions of her apartments on Fifth Avenue in New York. Now that sounds exciting. Atlantis (I get the mansion AND some gills, right?) would be brilliant. For above water cities, Calais (facing west), Cardiff or somewhere in the Mediterranean. Too many great choices! I follow you all over the place (NOT in a stalker-like way, though!). Um, Google, email, twitter etc etc etc. Atlantis? Now that'd be fun! Ocean view? Great suggestions and thanks for following (stalking) everywhere else and Tweeting. You now have multiple entries in the competition and more chances to win. I would choose London. My mansion would be my home base as I launch myself throughout Great Britain, Ireland & Europe. Thanks for your entries Mary. London would definitely be one of my choices, a great home base for Europe. I would pick New York, Some of the apartments there are amazing, I think there is so much you can do in New York from visiting all the museums, Broadway, Central Park. It is a place I have always wanted to visit. Melbourne. Probably in Brighton near the beach. Then I could have huge luxury parties with French champagne and oyster stations and we could dance the night away in my grand ballroom. The views over the water would be breath taking and I would hire my mansion out for functions like weddings and other grand parties. Hi Kathy, great choice and where Huguette spent the majority of her life. She must have loved it there. Hols24, wow, another entry for Melbourne. I can see you have it all planned though, and wish this was a comp for a mansion rather than a book so your vision could become reality. But then I wouldn't be giving it away would I? LOL! Good luck to both of you and thanks for your entries. Thanks for your entry Kris, seems New York is a popular destination. I would love my mansion to be in Adelaide, Tracey - have only visited once but loved that it didn't have the same feeling as larger cities such as Sydney and Melbourne. I imagine it would feel like 'home' immediately. Thanks Anon, I can definitely see the possibilities in Adelaide. Only four hours left to enter! Thanks to everyone for their competition entries, particularly those who earned additional entries by following, subscribing, Tweeting and sharing etc. Entries are now closed, and the winner will be announced over the weekend.